Named for it's multiple colors and vibrant landscape patterns. Polychrome jasper was discovered in the deserts of Madagascar in 2006 and is only available in small deposits. This opaque multi-coloredchalcedony develops in large formations and is believed to be one of the rarest on the planet. Metaphysically, Polychrome Jasper offers stability, balance and grounding. 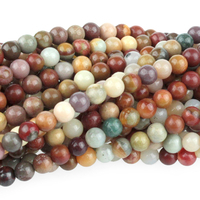 Also known as Desert Jasper and Royal Savannah Jasper. 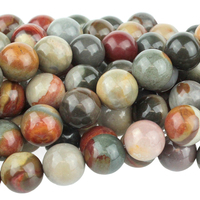 Polychrome Jasper 10mm round red, browns and grey New! Polychrome Jasper 4mm round red, browns and grey New! Polychrome Jasper 6mm round red, browns and grey New! 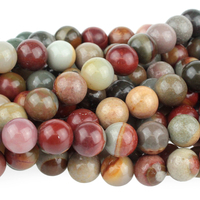 Polychrome Jasper 8mm round red, browns and grey New!